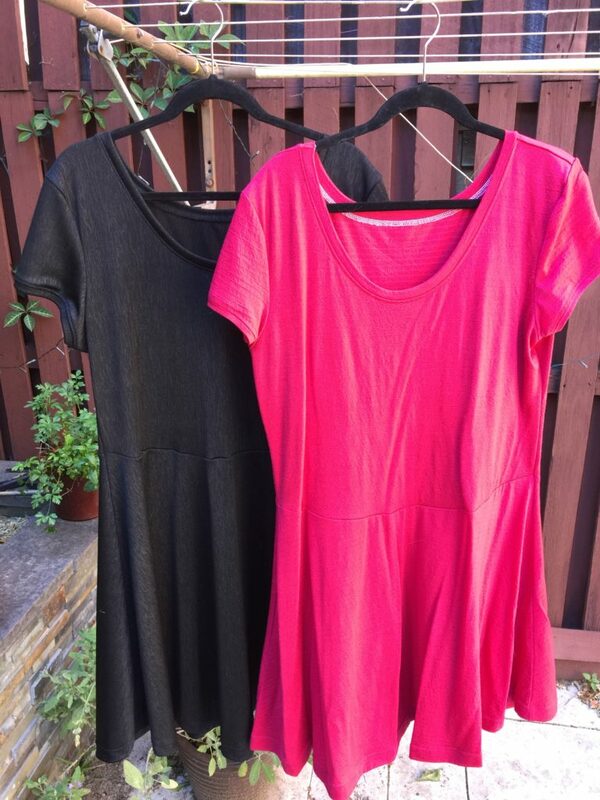 Finally blogging these two Lady Skater dresses that I made at the start of Frocktober. This pattern’s been on my wish list for a long time. It’s pretty fast to sew up, especially if you have an overlocker. I made the pink one first, and I used a fine merino jersey that I bought at Tessuti’s on clearance a few years back. It has a subtle texture through it, I think created by elastane that has been woven in narrow stripes. It was a pain to work with though, because it was nowhere near square and it curled like crazy. Still, I made that first one in about a day. I could tell while I was sewing it that the waist was going to be too low, but I shrugged, told myself it was a wearable muslin, and kept going. (The fabric had been really cheap as it had a hole at the end that I had to cut around.) The end result doesn’t look too bad in the photo, but it’s practically a drop-waist on me. That waist seam is supposed to be at my natural waist (ie the skinniest point), which is a fair bit higher. So for the black one, I shortened the bodice by about two inches. (You can see the difference in the photograph.) Better, but I still reckon I could go a bit higher next time. The fabric I used is really, really weird. I bought it at a remnant sale a long time ago, and I have no idea what it is. It feels quite heavy, almost like a rayon, with elastic shot through it. I feel like you easily could use it for leggings or even a bathing suit! But I made a dress out if it, because WHY NOT. It’s actually pretty comfortable to wear. Next #frocktober day 24: sleeveless Laurel from @colettepatterns, made by me!